Madrid is a city so full of life and culture that it’s hard to do justice to it in a few paragraphs. Artistically the city holds its own against any in Europe, with the of the best art museums on the continent where renaissance masterworks and seminal 20th-century pieces are waiting to captivate you. Take in all the historic sights and get the background on the Spanish Empire that spanned the globe in the 16th and 17th-centuries. There are also countless little things that make Madrid memorable, whether that’s a café con leche in a stately square, drinks at a rooftop bar or a wander through the Retiro or Casa de Campo on a sunny day. The Prado – Absolutely essential, the Prado is one of the best and most popular art museums in the world. There’s an overwhelming collection of masterpieces by renaissance and baroque masters. Spain is represented by Velázquez and El Greco, the low countries by Rembrandt, Brueghel, van Dyck and Rubens, while Titian, Caravaggio, Botticelli and Tintoretto form the Italian contingent. Of the many must-see works are Bosch’s Garden of Earthly Delights and David with Head of Goliath by Caravaggio. The artist with most works hanging at the Prado is the Spanish Romantic Goya, whose 14 Black Paintings are a Spanish cultural reference point. Retiro Park – Madrid’s green heart and full of elegant gardens, the Retiro is just a few steps east from the Prado and was a royal property up to the end of the 19th century when it was opened to the public. 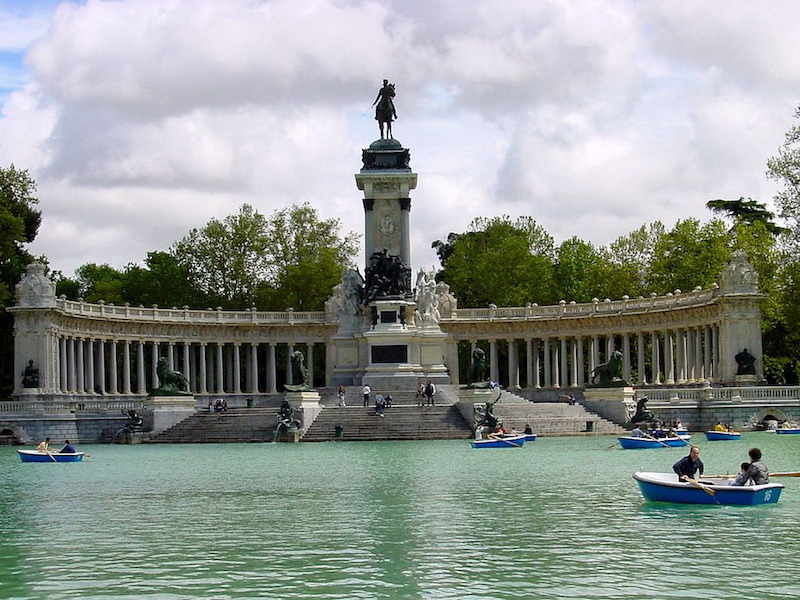 If you’re visiting with little ones, paddling on the Grand Pond next to the monument of Alfonso XII is a fun option on a sunny afternoon. The iron and glass pavilion built to house the Philippine Exhibition in 1887 is magnificent and growing in the pond in front of it are bald cypresses, strange swamp trees that turn a lovely golden brown in summer. The oldest tree in the city is close by: It’s a Montezuma Cypress planted in 1633 and ringed by an iron fence. Royal Palace – Built in the mid-1700s for King Philip V the Royal Palace is on the site of Madrid’s Moorish Alcázar fortress-palace, which burned down in 1734. It’s the largest royal palace in western Europe, and has a blend of baroque and neoclassical styles. You have to go inside for the full experience because the royal collections and frescoes are sublime. There are works by Goya, Caravaggio and Velázquez, as well as stunning displays of watches, tapestries, porcelain and silverware. You can see the only string quartet of Stradivarius instruments in the world, and the Royal Armoury that includes the personal weapons used by Charles V in the 16th Century. National Archaeological Museum – With invaluable pieces gathered from across Spain, this museum is a trip through Spain’s rich history. What may surprise you is the wealth of magnificent items that predate the Roman period. The best of these Iberian treasures and sculptures look almost new, despite being at least 2,500 years-old. The Lady of Elche is a bust of a woman with an incredibly detailed headdress and coils over her ears. Much later but no less impressive is the Treasure of Guarrazar a Visigothic set of crosses and votive crowns dating to the 600s. Puerta del Sol – This grand square next to the Casa de Correos (Post Office Building) is a popular meeting place, suffused with meaning for both city and country. Nearly every Spanish person will recognise the clock at the top of the Casa de Correos, as this marks the televised countdown on New Year’s Eve. There’s a tricky ritual involved too: With every chime you’re supposed to eat a grape for good luck (12 in total). Also in the square the is El Oso y El Madroño statue, a symbol for Madrid since the Middle Ages. Gran Vía – If you’d like to get a sense of the city, a walk along the Gran Vía is a superb place to start. It’s Madrid’s entertainment, shopping and cultural nerve centre, a buzzing avenue often full of life until dawn. By day it throngs with shoppers stopping by the many malls, high-street stores like H&M and Zara and luxury boutiques. In the evenings there are couples arm-in-arm, stepping out to the cinema or a musical. And after dark the street pulses with many of Madrid’s top nightclubs. Sights to spot as you stroll include the vast Telefónica Building, built in 1928 and an early example of a skyscraper. Plaza Mayor – Another of Madrid’s “musts”, Plaza Mayor is a handsome renaissance square, laid out in the early-1600s and completely sequestered by historic three-storey-high residential buildings. There are nine entrances to the square and within the porticoes at the bottom of the buildings are several cafes. Order a coffee (overpriced but necessary because of the location!) at an outdoor table and watch Madrid in action for a few minutes. After that you could wander up to the 400-year-old bronze statue of King Philip III, who was in power at the height of the Spanish empire. Mercado San Miguel – An easy walk from Plaza Mayor is this gorgeous art nouveau marketplace that dates to 1916. It’s less of a fresh produce market (although there are grocery stalls) and more of a gastronomic destination to purchase the best that Spain has to offer, like cava, pimenton (parprika) and saffron. There’s a host of tapas bars here serving all the favourites like patatas bravas, gambas al ajillo and boquerones, with a glass of beer, rioja or vermouth. To do your food shopping like a real Madrileño head to the vast Mercado de Maravillas in Cuatro Caminos. It’s Europe’s largest municipal market with 200 stalls. El Rastro – On Sundays it will seem like the entire city has descended on Ribera de Coritodores and Plaza de Cascorro. This is when some 3,500 stalls are open, hawking pretty much anything you can think of, whether used or new. It’s the largest flea market in Madrid and gets pretty hectic, so it’s always a good idea to show up early. Even though it’s a Sunday the antique shops on the streets branching off Ribera de Cortidores will be open, and there are also cafes if you’re in need of a pick-me-up after wading through the crowds. Thyssen-Bornemisza Museum of Art – If you still have an appetite for art after the Prado, amble over to this museum, which is also part of Madrid’s “Golden Triangle of Art”. You shouldn’t get bogged down, because the attractions in the Triangle are complementary, each covering schools and periods that the others do not. So at Thyssen-Bornemisza you can see works from the English and German schools by artists like Hans Holbein, Hans Baldung Grien and Albrecht Dürer. These are accompanied by pieces from other renaissance masters like Tintoretto, Veronese, Rembrandt, van Dyck and many more. There’s also a big collection of American abstract expressionism, and a host of impressionist and post-expressionist pieces by the likes of Monet, Renoir and Degas. Reina Sofia Museum – Round off your journey through Madrid’s art collections with the third museum on the Golden Triangle. This museum focuses mainly on Spanish art, and is more modern in scope than the others. The best reason to come is to the many works by the 20th-century artists Picasso and Dalí. Just to show that isn’t overkill: Picasso’s epoch-making Guernica is on display, so it’s an opportunity you really shouldn’t miss. Among the other Spanish greats represented at Reina Sofía are Joan Miró, Juan Gris and the important abstract sculptor Eduardo Chillida. Churros at San Ginés – Perfect in winter, Spanish hot chocolate is one of the most luxurious things you’ll ever taste. It can be so rich and thick you sometimes need a spoon to drink it. And the perfect pairing is a sugary churro, which if you don’t know, is piped dough, deep-fried. Just off the Puerta del Sol, visit the Chocolatería San Ginés, which has been serving churros and hot chocolate since the 19th century and does it as well as any joint in the city. If you can’t make it to San Ginés there are loads of stalls on the streets in the cooler months of the year. Beer at a bar terrace – In the summer many of Madrid’s bars and restaurants spill out onto the city’s pavements and squares. This an essential part of going out and socialising in the city. On Plaza de la Cebada on balmy summer evenings it can even be difficult to work your way through the throng. On the rooftops are terraces of a different kind. These bars enjoy jaw-dropping views of the city and are a fine way to usher in the sunset. Close to Plaza Mayor is The Hat, which like many of these bars doesn’t give you much of an indication of what you’ll find on the rooftop, where tables sit beneath a glass canopy and you can feast your eyes on Madrid’s cityscape. Flamenco tablaos – Flamenco is a dance that originated in Andalusia, Murcia and Extremadura, and even if it’s not strictly native to Madrid the city has some of the most famous tablaos in the country. These are special halls that cropped up in the 1960s, and here you see a show over a candlelit meal with sangria. It’s a fine way of killing two birds with one stone: Tucking into Spanish specialities like jamón ibérico, migas (fried bread seasoned with paprika) or roast suckling pig, while seeing one of the country’s most famous art-forms expressed by some of the best dancers in the flamenco world.